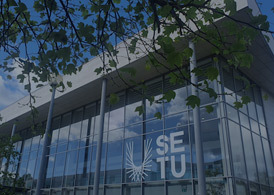 This statement relates to the Institute of Technology Carlow (IT Carlow) privacy practices in connection with the Institutes website. The Institute fully respects your right to privacy and takes every appropriate measure to secure the privacy of any information shared. The Institute is not responsible for the content or privacy practices of other external websites with links from the IT Carlow website. The privacy statements of such sites should be consulted in order to understand the policies and practices under which they operate. IT Carlow does not collect any personal information on this website without your permission. All information volunteered within emails and online forms is treated as confidential in accordance with the Data Protection Act 1988 and Data Protection (Amendment) Act 2003. Personal information such as email addresses is requested by online forms for the sole purpose of enabling the recipient in IT Carlow to reply to your request. Cookies are not used by this web site to store any visitor information. Some browser header information is automatically stored by the system to generate web site usage statistics. IT Carlow does not use malware, spyware, adware or tracking cookies in any form or fashion. IT Carlow uses every appropriate physical and technical security measure to prevent unauthorised access, alteration or destruction of data. These measures are reviewed regularly. IT Carlow will not disclose any personal information obtained from its web site to any third party unless required by law to do so.